There is a hunger and starvation. We often eat not because it has really hungry, but because a strong emotion drives to eat. In these cases there is a tendency to focus on foods high in fat and calories. It is instant gratification but short-lived because the negative emotional state does not disappear. These foods all contain tryptophan, an amino acid that stimulates the production of serotonin. - Sweet rich in refined sugars, shortly after ingestion cause a sudden drop in sugar which leads to eat again. 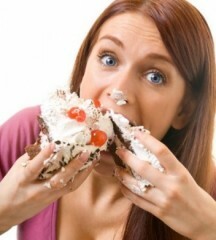 Essential to overcome the emotional eating / emotional is admitting you have the problem. -That thoughts, emotions we have at that time or what happened to make us feel that way. The aim of the journal is to become aware of their relationship with food. The second step is to learn techniques to manage their emotions without using food as an outlet. It is a path often not simple, which is useful for the support of specialists. Benesserlife - The Association Glutamine - Rhodiola, in fact, works by helping the brain especially in the centers of hunger and satiety through neuro-modulating action.